The worship team and sound team serve a very important function at TCC. At the core of our vision is a commitment to worship: “aimed at glorifying God, experiencing His presence, and hearing His voice.” Both the preparation and presentation of worship are taken very seriously. We are blessed by this longstanding commitment to Spirit-filled worship founded in the truth of God’s Word. Twinbrook Christian Daycare (TCD) is a church-based, Christ-modeling ministry of Twinbrook Community Church. Our experienced staff has been serving the Rockville area since 2007. Please call us for a personal tour and program presentation today. On a semester basis in the Spring and Fall, there are in-depth biblical study classes presented for adults. For more information, please check our calendar for dates and times. The youth of TCC is under reconstruction, more information will be available soon. Under the leadership of Jennifer Collison and the loving relationships of our "Twinbrook Children's Ministry Teams," children will have a blast learning about Jesus while listening to Bible stories, memorizing scriptures, singing songs, doing skits, and creating crafts. The Children's Ministry has started two great new weekly curriculums from Gospel Light and Scripture Press. "Baby Blessings" are using Baby Beginnings from Gospel Light which remembers what it's like to see the world through a child's eyes, and teaching God and His Word through hands-on activities that engage their intense curiosity and openness to learning new things. "Young Blessings" and "Older Blessings" are using curriculum from Scripture Press which is a learning experience entirely on the scriptures and about applying the truth of scriptures directly to real-life situations. When special prayer is needed or when information needs to be given to the church, an email chain is initiated. This very valuable tool puts the congregation in touch with important needs and issues on a daily basis. The usher Ministry serves each Sunday and at special services during the year. This valuable ministry is aimed at greeting and serving the congregation of TCC for communion and the offering each Lord’s Day. Seeing a joyful face and receiving a warm handshake or hug on Sunday mornings is important. We have a group of very committed greeters at TCC who do just that. A simple job with a big result. Our Greeters are committed to making everyone’s first impression of TCC that of a warm and loving welcome. This is one of the most important and highly involved ministries of TCC. Each Sunday after the morning service light refreshments: bagels, etc. and coffee and drinks are served. It is a time to meet new people and enjoy the company of old friends. 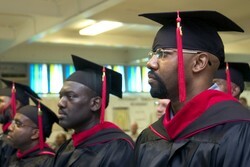 Covenant Theological Seminary, Florida was established in the early 1990’s as a discipleship training school. CTS offers Master's level self-directed theological training through it's membership in the Council of Private Colleges of America (CPCA) for called men and women. Since 2003 CTS has offered seminary level training to inmates of the Maryland Correctional Training Center in Hagerstown, Maryland. This has also been a ministry focus of TCC as the church has supported the effort financially and through a continuous prayer covering. The ministry has expanded to include a number of inmates from other prisons and released men finishing programs in the area. See the article in the Frederick News Post.